Background: Alzheimer’s Disease (AD) and Parkinson’s Disease (PD) are among the most common causes of dementia, which increasingly contribute to morbidity and mortality worldwide. A common hallmark in the pathogenesis of these two diseases is neuroinflammation, which is initially triggered by the presence of pathological structures associated with these disorders. Chronic neuroinflammation is sustained by persistent and aberrant microglial activation in the brain, which results in damage and death of neighboring cells, including neurons and glial cells. Two types of risk factors contribute to the development of AD and PD: non-modifiable risk factors and modifiable risk factors. Non-modifiable risk factors include genetic susceptibility that increases an individual’s risk of developing the disease, whereas modifiable risk factors include a wide variety of health- and lifestyle-related factors that may be altered by changing individual behaviors. Method: Ovid Medline and PubMed databases were used to perform an ordered search of the peerreviewed research literature described in this review. Results: This review focuses on four modifiable risk factors including physical inactivity, vascular disease-related conditions, obesity and type two diabetes mellitus, all of which have been identified as risk factors for the development of AD and PD. Conclusion: We highlight that control of the modifiable risk factors is a valid approach for managing the increased incidence of AD and PD. 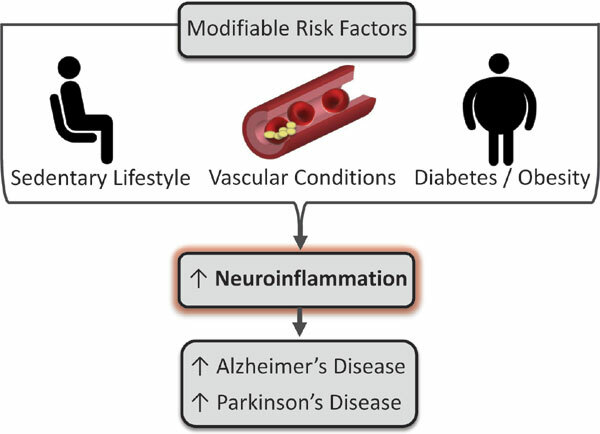 We describe neuroinflammatory mechanisms, which are common to AD and PD that may link both these neurodegenerative diseases with the four common modifiable risk factors. Understanding neuroinflammatory mechanisms could help identify novel therapeutic targets for combating these neurodegenerative diseases. Keywords: Physical inactivity, type 2 diabetes mellitus, obesity, hypertension, microglia, dementia. Keywords:Physical inactivity, type 2 diabetes mellitus, obesity, hypertension, microglia, dementia. Abstract:Background: Alzheimer’s Disease (AD) and Parkinson’s Disease (PD) are among the most common causes of dementia, which increasingly contribute to morbidity and mortality worldwide. A common hallmark in the pathogenesis of these two diseases is neuroinflammation, which is initially triggered by the presence of pathological structures associated with these disorders. Chronic neuroinflammation is sustained by persistent and aberrant microglial activation in the brain, which results in damage and death of neighboring cells, including neurons and glial cells. Two types of risk factors contribute to the development of AD and PD: non-modifiable risk factors and modifiable risk factors. Non-modifiable risk factors include genetic susceptibility that increases an individual’s risk of developing the disease, whereas modifiable risk factors include a wide variety of health- and lifestyle-related factors that may be altered by changing individual behaviors.